Dokkum is a small city in Fryslan Province in the northern Netherlands, an ancient ,friendly place. If you're looking for a destination "off the beaten track" This may be the place. It is one of the "Elfsteden" of Fryslan...and a town where many speak the Frisian language. It is a well preserved /compact place easily explored on foot ... from what I understand late June thru early September is the heavy tourist season. The Centrum is located within a six pointed star of the Bolwerks, which are labeled by their directions eg. 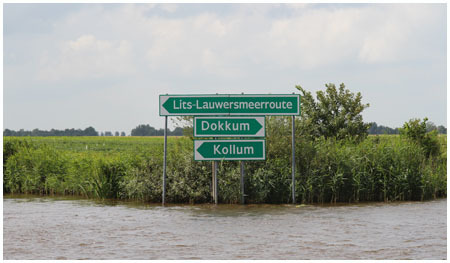 "Zuiderbolwerk" is in Southern part of the star. 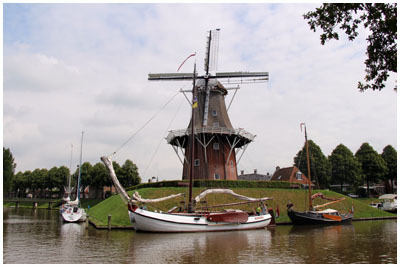 With canals, windmills,intersting boats ,and a touching Monument to events that involved the townspeople during WW2. It should not be missed. But the avid photographer will find many interesting shots throughout Dokkum. Pick up a Dokkemer Zomerkrant -a newspaper like publication for tourists..(well ,if you arrive in Zomer) ...which will list activities,and includes a nice map of things and provides a walking tour of the town. Dokkum North Friesland by motor boat. Charter Leeuwarden, boating holiday. Route Friesland by motor boat cruising.Boat cruise,visit Friesland by boat cruising, Friesland by boat. Boat 'n bike, cruising Friesland, waterways and lakes in Friesland. Looking for Hire company Yachtcharter Leeuwarden. Cannel barges hire, narrowboat,Cannel cruise on dutch inland waterways, Boating holiday by Yachtcharter Leeuwarden - Dutch Yacht Charter, Boating holidays an Netherlands inland waterways. Barge holidays and cruise vacations on frisian canals. Our luxury barges offer all the comforts of home while, cruising on the water.